Home Numerology Angel Number Meanings Quadruple Digit Angel Numbers Meanings Angel Number 1144 Meanings – Why Are You Seeing 1144? Some days, the same number seems to show up everywhere. You finish an unexpected and interesting conversation with a work colleague, glancing at the clock, you are surprised to see that it is 11:44am. You pop out for an early lunch to clear your head. Grabbing something at a nearby café, your total comes to $11.44. As you return to the office, without paying attention you to take a leaflet from someone in the street. When you look down at it, you see that the phone number listed ends in 1144. Why is this same number everywhere you look? It is likely no coincidence, but rather a message from the Angels. What could the quadruple digit Angel Number 1144 be trying to tell you? What does Angel Number 1144 mean for love? Angel Number 1144 is a call to action, as it starts with the number 1. This is the number of new opportunities, and your personal power to shape your life through your own actions and decisions. It suggests that an opportunity is before you, but that you need to take the lead in terms of grasping it and shaping it. The number 1 leads into the number 4, which represents the foundations of our world, and the rules by which we choose to live. It suggests that we need to respect these foundations and rules, or change them if they no longer serve us. 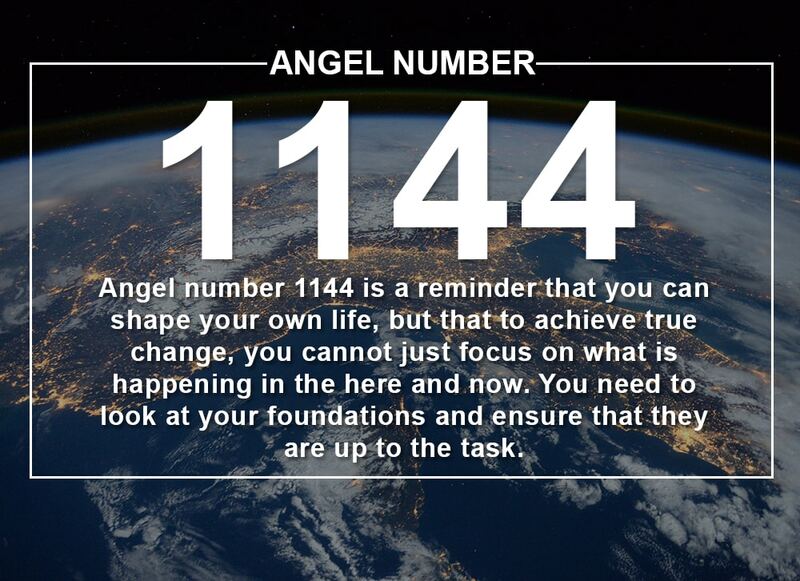 Angel number 1144 is a reminder that you can shape your own life, but that to achieve true change, you cannot just focus on what is happening in the here and now. You need to look at your foundations and ensure that they are up to the task. We have a great idea that we want to take forward, but we know that getting buy in from all the people around us will be challenging, and will probably delay things to the point where it is not possible anymore. As long as your plan does not seriously inhibit someone else’s freedom of choice, sometimes it can be better to ask for forgiveness rather than permission. The appearance of Angel Number 1144 can suggest that in this case now. Don’t worry about consulting everyone, and go ahead with your plan. If you produce results, everyone will still be happy. Rules exist for a reason, to help us work together and to keep us safe. But sometimes rules outlive their usefulness and become a hindrance rather than a help. 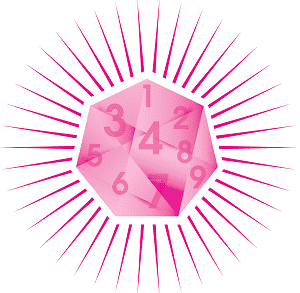 If a certain rule is holding you back, Angel Number 1144 suggests that it is time to change the rules. If this is an arbitrary rule that you have made for yourself, consider why you thought this rule was important. If it is a shared rule, discuss it with others and look for ways it can be changed and improved, for everyone’s benefit. It rarely pays to be rigid and refuse to do something because its not in your ‘job description’. Taking on extra responsibility can be a way to show that you are ready for more. But there comes a point where your working up needs to be recognised. If that is you, Angel Number 1144 suggests that it is time to ask for that pay rise or new job title. This extends to our personal lives as well. 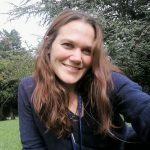 Are we getting the recognition we deserve for the work we are doing? Often when we are trying to figure out a problem, we spend too much time looking at the leaves for the cause, and forget to look at the roots. Angel Number 1144 suggests that we look at our foundations to find the root cause of a problem. This might be linked to an argument we are having with a loved one, a problem at work, or something to do with our health. Is an aesthetic problem actually a sign of something more serious? Look deeper. If we broke the promises that we made to our friends in the same way we break the promises that we make to ourselves, we would not have friends who trusted us. Angel Number 1144 may show up to remind you that the promises that you make to yourself are the most important. If you can’t trust you, who can you trust? It also means that we should be careful with the promises that we make to ourselves, and set ourselves up for success. There is no point in making the same promise that we have failed to keep over and over again. Start with little things that you can achieve, and think about how you are going to hold yourself accountable. Angel Number 1144 is usually a positive sign when it comes to love. It suggests that something will happen that will shake your foundations. Perhaps you are going to meet someone who you are going to have a serious relationship with, and will change your life in one way or another. Perhaps an existing relationship will grow firmer foundations, a wedding, buying a house, children, something like this. 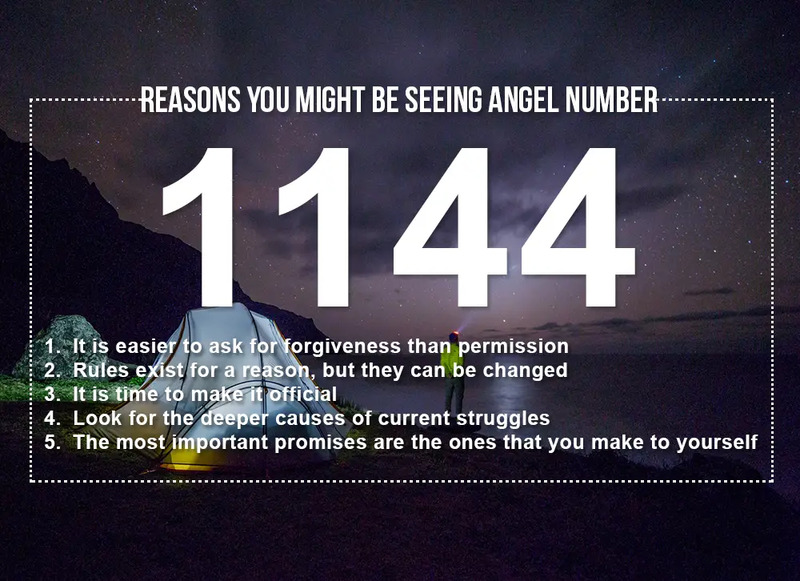 However, the 1144 Angel Number can also be a reminder about the promises you have made yourself about love. Have you promised that you will not continue a pattern of dating people who are unavailable? Have you promised that if your partner lies to you again, or worse, you are going to walk away? Angel Number 1144 can remind you that it is important to keep this promise. When you see an Angel Number, you should always feel blessed. The Angels are trying to help you, and you are at a place in your life where you are ready to receive their help. Deciphering their message can be challenging, as they cannot communicate with us directly and numbers have multifaceted meanings. But Angels want to be understood, so they will reveal their numbers within a context that allows us to understand them. Pay attention to what you were doing and thinking when you notice the number to understand what it relates to. Once you have understood your Angel Number message, make sure you pay attention to it. You cannot expect the Angels to continue to help you, or for your intuition to continue to notice these numbers, if you do not give them the attention that they deserve. Do you seek guidance and insights into the past, present and future, with regards to relationships, love, or money? 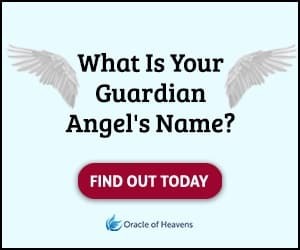 If you are frequently seeing the 1144 Angel Number, take this popular free test to see whether your Guardian Angel is trying to send you an urgent message. Seeing the number 1144 everywhere? Could you be seeing an Angel Number? See what important message Angel Number 1144 might have for you.